A club for the Spice and Wolf lovers! Kraft Lawrence, a twenty-five-year-old traveling merchant, comes to the town of Pasroe during a harvest festival. Lawrence meets a girl who claims that she is the legendary wolf-deity, Holo. together they go on a journey to return Holo to her homeland. Anyone seen this Holo figure before? RenOfHeavens (1 anno/i fa) #26590574Anybody know more about the first Horo here? It's by Plum, distributed by GSC. Currently up for PO atm. Anybody know more about the first Horo here? 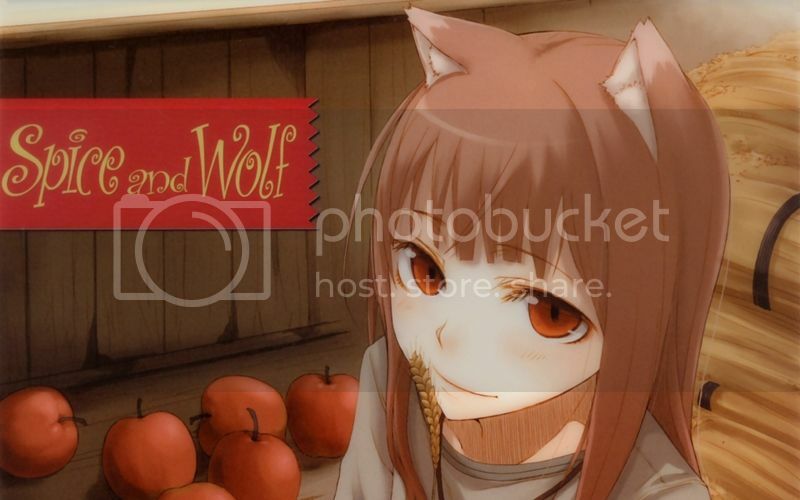 First chapter of the new Spice and Wolf series is out! The editor of the previous fan translation is working on it, so we should have a translation up hopefully in the next week or so. Follow the S&W Reddit, if you aren't. Also Isuna Hasekura is a massive troll haha. But it's great for S&W to be back! SPICE AND WOLF SEQUEL ANNOUNCED!!! It will start publishing in Kadokawa's Dengeki Bunko Magazine #49 on April 9. Of course take this with a grain of salt until we see something tangible lol. The 19th anniversary is Feb 10th. An anniversary website will be going up then. I just started reading the Manga about a month ago not knowing anything about this series(Currently on Vol 5). OMG It's really is a good story, much more than I was expecting. It was refreshing to read something like this, a traveling merchant and a clever wolf set in what seems like celtic times(correct me if im wrong. I know its historical fiction) and deals with economic and trade. Anyone seen this shirt before? Yep, that was on sale a couple years ago... So, some folks finally started getting the idea to sell them on eBay, huh? These aren't always legitimate but sometimes are the only option. Still, I bought one over there when they came out... definitely one of my favorites! i.minus.com/ixT... \o/ I need to catch up on the manga, but the latest LNs arrived today. Yupa (4 anno/i fa) #2307530Never participated in an online auction before? The true bids can be much higher than what's shown for. If the current price is at 78,000 yen and you place a bid of 100,000 yen, it only shows as a bid of 79,000 yen. If someone else bids higher, the system automatically places a bid for you that is 1000 yen higher than that, but not more than your maximum bid of 100,000 yen. In other words, the winning bid was 78,000 yen, but that winner probably placed a bid much higher than that. He only has to pay the second highest bid + 1000 yen. I won't argue with you dude. All I said was that I bid 80,000... Closing price was listed as 78,000. I have participated in many an auction, and I read the mechanics of an auction before participating... anyway, I looked back, and it never registered my bid.